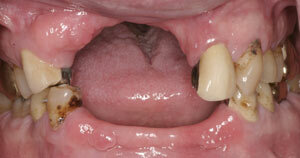 This is an example of non-removable tooth replacement for a patient with severe bone loss on the upper arch. Implants were not an option due to the extent of bone loss. Dr. Simon provided a fixed bridge with tissue colored porcelain to replace the upper teeth. Lowers shown are temporaries.